Air purifiers are required in wide variety of applications. Construction sites, renovation sites, clean rooms, hospital rooms, factories, etc. are few examples. The operating principle is to pass the air through a series of HEPA filters to purify the air. In construction sites and factories, huge amount of extremely fine particles pollute the air. While breathing, these particles enter into the lungs of the workers, causing health hazards. 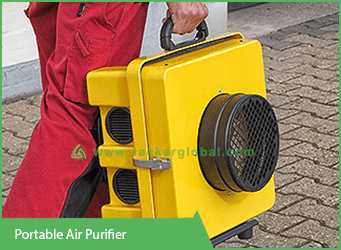 We supply wide variety of industrial air cleaners for these purposes. The HEPA air cleaners are used in wide variety of following industrial and commercial applications. Removal of paint spray particles in paint booths, automobile workshops, etc. Removal of construction dust from work sites, construction sites, renovation sites etc. Maintaining clean air in clean rooms, laboratories, research centers, restaurants, hotels etc. Removal of gypsum particles from the air in interior construction environment. 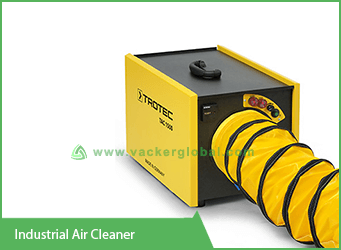 For cleaning the air in sand blasting operations in factories. Applications involving mould fungus removals. 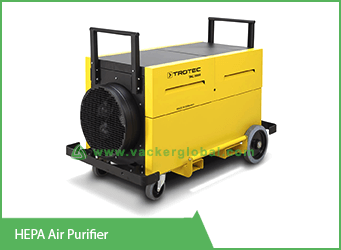 We supply different types of industrial and commercial air purifiers manufactured by Trotec, Germany. Few of the major models are listed below. 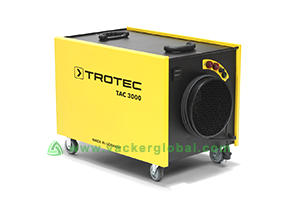 This is our lightweight, portable, commercial type air cleaner suitable for use at workshops, offices, warehouses, construction sites etc. Even though small in size, you can connect an air hose for better circulation. It is extremely portable with a weight of only 6 kg, without packing. It has a two stage filtering, making it suitable for small construction sites as well. It has a Maximum air volume flow of 750 m³/h. It has a maximum negative static pressure of 720 Pa. It operates on single phase 230 V, 50 Hz and consumes an electric power of 0.12 kW only. 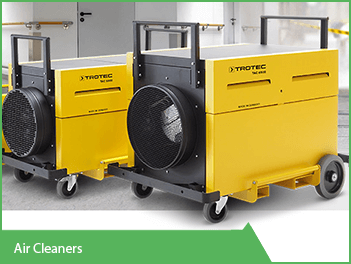 This model is suitable for wide range of applications from construction sites to clean rooms. It has adjustable HEPA filters. It has sensors, which check the particle concentration as well as the condition of the HEPA filtration. It will warn you when it is about to change the filter. This is a portable, but robust model for applications in factories, construction sites etc. It has a Maximum air volume flow of 1,000 m³/h. It generates negative static pressure of 900 Pa. It operates on single phase 230 V, 50 Hz. Sound level is 61 decibel at a distance of 1 meter. This HEPA air cleaner has a nominal current consumption of 1.6 amperes only. This air cleaner is with class H and is also useful for construction sites and high quality clean rooms. The machine will warn you when it is about to change the filter. It has a Maximum air volume flow of 2,150 m³/h. It generates negative static pressure of 1100 Pa. It operates on single phase 230 V, 50 Hz and consumes 0.45 kW approximately. It has a radial fan. The weight of this HEPA air purifier is 36 kg. The HEPA filtration system is continuously monitored in all our models. It is a mid range commercial air purifier suitable mainly for clean rooms, but can also be used construction sites and factories. The user can re-configure the filters to achieve different levels of performance. So based on your site requirements, you can rearrange the filters suitably. Maximum air flow rate of this air purifier without filter is approx. 4,500 m³/h. Maximum low pressure is 1,240 Pa. It operates on single phase 230 V, 50 Hz and consumes 1.27 kW approximately. It consumes a current of 5.6 Ampere approximately. The weight of this HEPA air purifier is 125 kg. This is our high capacity HEPA air cleaner with an air volume capacity of 5,700 m³/h. You can check our Selection Chart for selecting from our wide range of air cleaners. It operates on single phase 230 V, 50 Hz and consumes 1.4 kW approximately. Maximum Negative static pressure is 1.150 Pa. It has an average current consumption of 6 Ampere. It produces a sound of 68 decibels at a distance of 1 meter. How to use the air cleaners? Basically, the air is drawn into the cleaner through the inlet. The air is processed inside the machine and driven out through the outlet. Regarding the air flow, you can connect it in different ways. You can direct the processed air out of the room and bring fresh air into the room. Alternatively, you can recirculate the processed air into the same room. Different methods of installation of air cleaners are shown in this image. 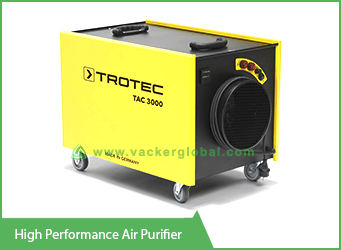 Below you can find detailed filtration efficiencies along with pollutant particle sizes for different types of Air Cleaners.